End 2010/begin 2011 I bought a Belkin KVM Omniview 5216K. When I first started to use is a few months later, it crashed so often that the device was useless. And if accidentilly, I could connect, keys got stuck so often that typing my username or password was absolutely impossible. With one of the required reboots, the device finally died on june 17 of that year. After having to deal with a terrible helpdesk that answered things that resemble "so, your car crashed into a canyon? Have you tried to restart your car to fix this?" 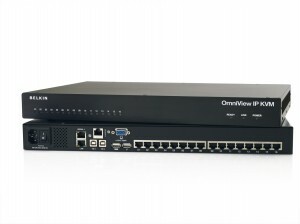 and weeks of waiting, it finally got replaced by a 32 port switch, the Belkin Omniview IP 5232K KVM Switch.. Since the new device has a new firmware, the stuck keys got a little better. But another problem came up. I just tried to login to the device. And I definitely used the right password. The device is only accessible over VPN, so it's very unlikely that someone else got access to the device. And last time, I had this problem, the device just needed a restart to recognise my password again. Probably the internal authentication daemon has died or something. Dit bericht werd geplaatst in IT en getagged met 5216k, Belkin, Dead, Omniview, rant, Review op mei 1, 2013 door David (admin). After my Belkin 5126K broke down, I tried to get Belkin to fix it. I'm not very pleased with the results so far. Last tuesday, I filled in a RMA form to get my Belkin Omniview 5216K repaired or replaced. It doesn't boot at all, but instead of fixing the device, I got a mail with instructions to reset the device to factory defaults. Belkin probably gets a shitload of dumb customers that can be helped in a minute. But apparently that makes the support team try a lot of standard routines without even reading what the complaint is. Step 1 Take a USB flash drive (any type will do) and create a new text file in its root. Step 2 Rename the file to 'default'. This file shouldn’t have any content or extension; it should just be an empty file with the size of zero. Step 3 Connect the KVM switch to the monitor and connect the USB flash drive to one of the USB ports on the KVM switch. Step 4 Restart KVM switch. The switch will boot, find the file, restore the factory settings, delete the file, and restart again. All these operations will be performed automatically. Step 5 Wait for the On-Screen Display (OSD) menu to appear. When it does, the switch has been restored to its factory settings. Of course that didn't fix anything, because to restore the settings to factory default, the device should at least load the bootloader. So I mailed them the results. This time, I got a mail to update the firmware. Didn't I just tell them that the device doesn't boot? I mailed them back. Again. After not hearing from Belkin, I decided to give them a call. No luck either. The guy I spoke to could do nothing more than write down my complaint for someone else to fix. After the weekend of course. Let's wait and see. For now the device that cost me about €1590 hasn't been able to save me any trips to the datacenter, but cost me two instead. Dit bericht werd geplaatst in IT en getagged met 5216k, Belkin, Dead, Omniview, rant, Review op juni 17, 2011 door David (admin). A few months ago I got myself quite an expensive new device: a Belkin Omniview 5216K, model no F1DP216G. With this device, I'm supposed to be able to access the KVM of up to 16 servers. I can install them servers remotely (over PXE or virtual media), configure the system BIOS. All without going to the data center. This way I can offer a better service on my servers from anywhere in the world. High-Performance Remote Access Access, switch, view, and control faster than before. Switch from one remote server to another instantly. Quicker performance over Internet and congested networks. Web Browser-Based The Switch allows you to access your KVM switch and all connected servers from any computer connected to the LAN, WAN, or Internet using Firefox or Microsoft Internet Explorer. Out of Band--BIOS-Level Access The Switch allows you to remotely access the basic input/output system (BIOS) of your servers to make changes and perform reboots, regardless of network connectivity or server condition. User-Friendly Interface The web-based interface allows you to set up and change the Switch functions quickly and easily through your web browser, without having to install additional software onto your servers. Remote Serial Access The Switch provides support for up to two serial devices, such as a managed power distribution unit (PDU), so you can remotely perform hard reboots of your servers. Virtual Media Technology The Switch provides virtual media support for up to two servers. This allows remote users to copy files for their USB or CD-ROM drive to a target server that may be anywhere in the world. Enhanced Security The IP device provides 128-bit Secure Sockets Layer (SSL) authentication and password protection to prevent unauthorized access to your servers and protect data transferred over the Internet. Scalable Centralized Management Additional Switches can be added as your data center grows and the entire inventory can be managed under the Belkin Central Access Appliance 5000HQ. Video Resolution The Switch supports video resolutions of up to 1600x1200@75Hz for both local and remote consoles. Flash-Upgradeable Flash upgrades allow you to obtain the latest firmware updates for your Switch. These firmware updates ensure that the Switch is compatible with the latest devices. Well, let's just say I'm happy I got myself an Ingrasys iPoman 1201 remote power switch as well. Before I upgraded the KVMs firmware, the devices wasn't usable at all. After the upgrade to the newest firmware, the device got a little better. But still, the Mean Time Between Failure (MTBF) is literaly just minutes. In the last 2 hours, I had to switch off the power several times. And there hasn't been a single time in these 2 hours that I could use the KVM switch for more than 5 minutes without it crashing. I actually made a shell script to reset the KVM switch. When resetting the switch, I'm pinging it to see if I can reach it again. On the last reset I just did, the device stayed available for only 14 seconds(!!). Of course, the device can't handle Linux clients. So I have to run a Windows instance in VMWare player to access the device. Update: I almost forgot to mention that I really can't type one sentence without having a key stuckkkkkkkkkkkkkkkkkkkkkkkkkkkkkk. ARGH! It's crap. Don't buy one. The idea of KVM-over-IP is great, but if the device locks me out by crashing so often, it's absolutely worthless. I'm calling Belkin and/or the store as soon as the holidays are over to see if I can return the device. Dit bericht werd geplaatst in Hardware, IT en getagged met 5216k, Belkin, Dead, Omniview, rant, Review op juni 11, 2011 door David (admin).